Feature photo: This Valentine’s Day, enjoy a variety of chocolate treats from Xocolatl Small Batch Chocolate, the Atlanta, GA-based bean-to-bar craft chocolate maker. Delicious treats are available for online ordering at www.xocolatlchocolate.com and in Xocolatl’s Krog Street Market shop. 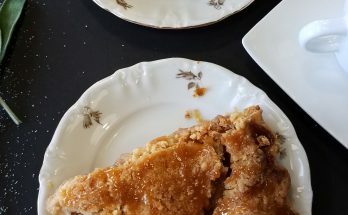 Our Valentine’s Day round-up has something for everyone looking to celebrate this week — couples, friends, singles, and anyone who loves good food! Planning a romantic evening for Valentine’s Day? 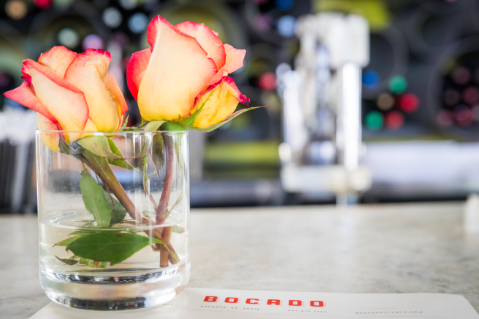 BOCADO will be serving a celebratory menu of à la carte favorites to enjoy with a loved one on Feb. 14 including citrus and beets with tzatziki, pumpkin seed, and lemon; Trout with a cauliflower puree, brown butter, and arugula; and Lobster Tagliatelle, a mix of Maine lobster, lobster broth, chili, basil, and breadcrumb. Guests are encouraged to reserve a table online here or by calling (404) 815-1399. Single this Valentine’s Day? Celebrate the holiday with Hampton + Hudson at their Valentine’s Day Hans Solo Party, featuring a $5 solo cup cocktail, half-off wine carafes, $2 solo cup beer, Star Wars playing on all TVs, and a DJ spinning from 8pm-12am. 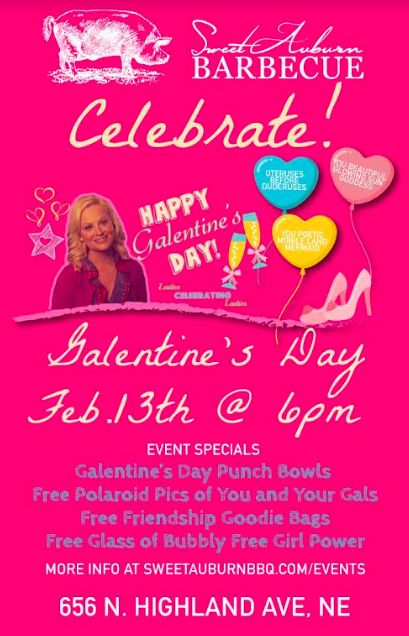 Celebrate female friendship with Galentine’s Day at Sweet Auburn BBQ on Feb. 13! The restaurant will be decorated to recognize amazing women, and guests will enjoy special punch bowls, goodie bags, free Polaroid pics, and more. Cozy up with your loved one at The Brasserie at Bazati and enjoy a five-course menu (here) from Executive Chef Remi Granger on Valentine’s Day. Wine pairings will be available for $50 per person, and the menu costs $90 per person, including a glass of bubbly and dessert. 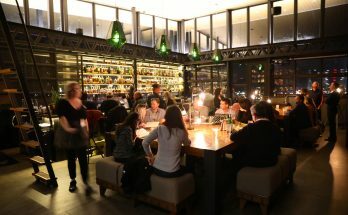 This Valentine’s Day, Executive Chef Pat Pascarella will be serving a four-course prix fixe menu, including Marinated Beets & Citrus with Whipped Stracciatella, Pistachios, and Mint; Tortellini with Burrata, Charred Winter Onion Dashi, Crispy Maitake, and Ricotta Salata; and Duck, Baby Carrots, Burnt Onion Crema, Torched Oranges, Pickled Mustard Seeds, and Sweet Potato Chips. 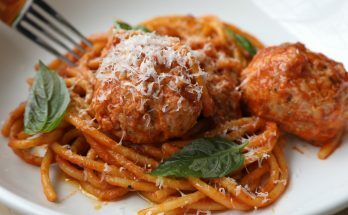 The menu costs $85 per person, including a toast of Prosecco, and wine pairings are available for $55 per person. 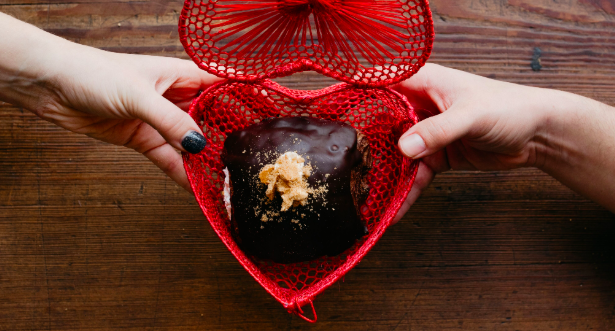 Ponce City Market @ 675 Ponce de Leon Ave NE // Wednesday, Feb 13: Galentine’s Day at Root Baking Co. In celebration of Galentine’s Day, Root Baking Co. is celebrating with sparkling wine, snacks, and cookies that guests can decorate and take home. The event is from 6-8pm and for attendees 21+. Tickets are $60/each and can be purchased online.